Sign up now for the 2012 St Louis Show! For maximum FUN, be sure to bring a stylist friend!!!! This is a WIN-WIN situation for YOU & YOUR salon! As you may know, stylists from all over the St Louis area come together to donate their skills and time to provide haircuts to some of the thousands of (mostly women) visitors that bring a NEW child's hat for kids that have cancer and are loosing their hair. Talk about a win-win situation! First, the kids get NEW hats. Secondly, the visitors get great haircuts. Thirdly, you and your salon win big time! Not only will you be able to advertise you and your salon with your cards and coupons we give out all weekend long, but we will also give you a FREE pass to get in. Not only that, you can look at all the other exhibits before and after cutting hair. You will have many new customers and new friends that you will meet here. In fact, because you are volunteering to help kids, many of the visitors that you cut will drive the extra distance to become a good client of yours! We will also be given out FREE sample products. And to these samples, you can to attach your coupons or business cards if we get some this year. The visitors stand in line to get a sample with the advertisements! Isn't this a great deal? 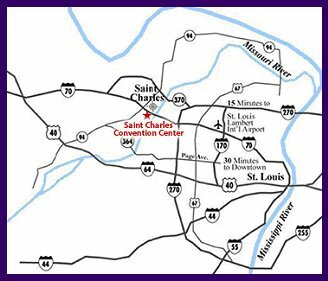 This will be our tenth HO4C cut-a-thon at the St Louis Woman Show (AKA Working Women's Survival Show), and it gets better every year. Also, the television stations also come by an interview the volunteer stylists (only the stylists who would like to be interviewed). Talk about great PR for you and your salon! We will have hydraulic chairs, contiguous station tables, electricity, lights, and good size mirrors on the walls. We will also have towels, water, show capes, santitizers, tons of Redken product samples, and lots of (new clients) people needing haircuts. You will need to bring your scissors, combs, blow dryer (kinda dry hair, not full styling), hand mirrors, your cape (if you have a special one you like), business cards and your coupons. You may and should wear your salon shirts (with your salon name), if your salon has them! If you do not have salon shirts or smocks, you should consider these. Brand name your salon here. It would cost you thousands of dollars to get advertisement like this...Many of the show visitors will watch you the stylist at work and will ask for your card! Your informational packets will contain all of the information you will need to know, plus the 20 top marketing tips for you and your salon. Hats Off 4 Cancer's location (upstairs, booth L-16 of Hall 1) for this year's show will be in your packet of information. Need driving directions or larger map? 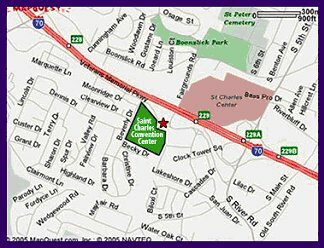 FREE PARKING - Free on-site parking within the St. Charles Convention Center lots. Free parking in the two commuter lots in front of the Convention Center facing the access road.